On Feb. 13, the Board of County Commissioners unanimously approved a resolution committing the community to using 100 percent renewable energy by 2035. The resolution is similar to the one passed by the town of Breckenridge back in November, which also committed to getting all energy from renewable sources by 2035. 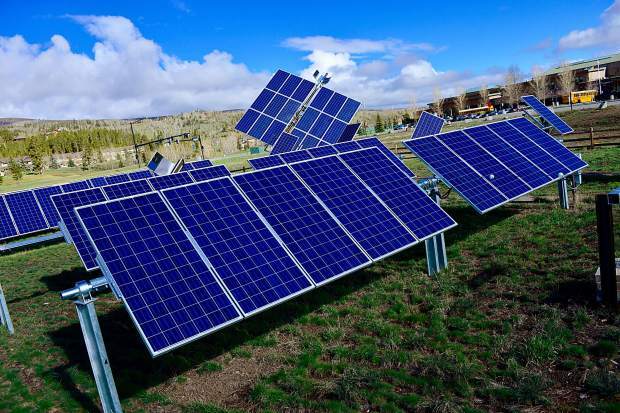 By passing the resolution, Summit joins other Colorado counties and towns going fully renewable, including Aspen, Avon, Boulder, Lafeyette, Longmont, Nederland and Pueblo. Larger cities outside the state have also committed, including Atlanta, Orlando, Salt Lake City and San Francisco. County Commissioner Karn Stiegelmeier felt the issue was of the utmost importance to the county, given the alarming new data about climate change. The commissioners passed the resolution after attending the Colorado Community Symposium conference in Denver, where local and state elected officials met and discussed collaboration with business leaders and innovators involved in producing renewable energy technology. Commissioner Dan Gibbs said the conference was very informative, and spurred the commissioners in taking an affirmative step in the right direction. When it comes to specifics, Gibbs noted that one way the county can reduce its carbon footprint is upgrading the public bus fleet. County manager Scott Vargo noted that the resolution is a non-binding community commitment, and will not require county government, homeowners or private businesses to purchase or upgrade electrical systems. The county will instead work with energy companies like Xcel to get them to switch more and more to renewable energy and away from fossil-fuel-based energy sources. The resolution has some caveats and exceptions to the goal, such as reserving the right to modify the commitment if consumer costs increase. As to why Summit is passing the resolution now, Gibbs said progressive change is oftentimes led by local government. The resolution does not set a timeline for milestones or goals, and planning for the initiative has not yet begun.